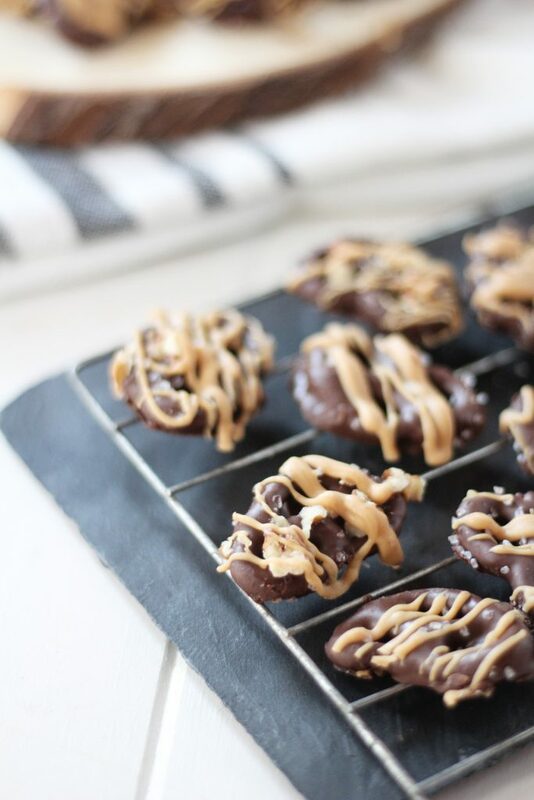 Sweet and Salty meet in these chocolate covered Salted Peanut Butter Pretzels. The perfect treat for friends and family this holiday season. Have you started your Christmas baking? Do your bake lots of goodies for Christmas? I do and it all started this past weekend. I went crazy making all the things and am sharing them with family and friends this weekend. 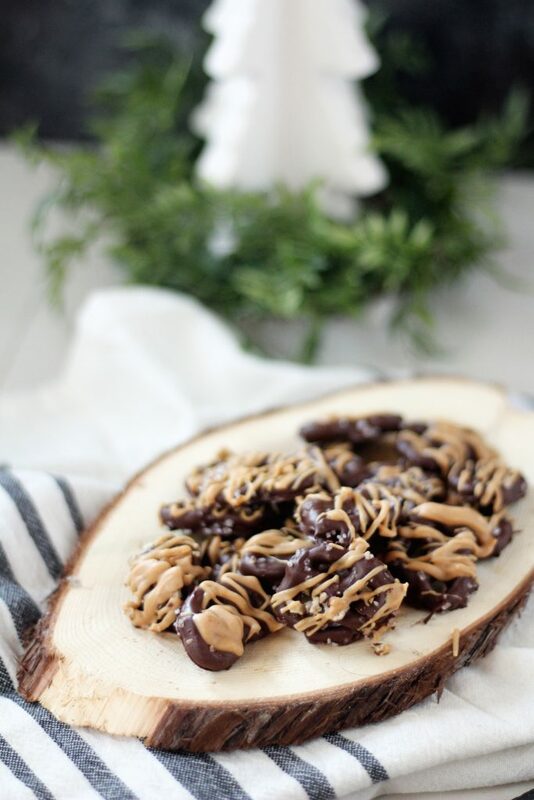 This Salted Peanut Butter Pretzels recipe was so simple and I can’t wait to share it with you. Keep reading for the full recipe. I have some of my favorites that I make every year but this year I’m also adding in a few new recipes. All year long I am on the hunt for what can be added to me treat boxes. When the publishers of Valerie’s Home Cooking Cookbook contacted me and asked if I’d like a copy of her new cookbook to review I jumped at the chance. I love her and her cooking show and knew she’d have some great recipes in there. And let me tell you I was not disappointed. 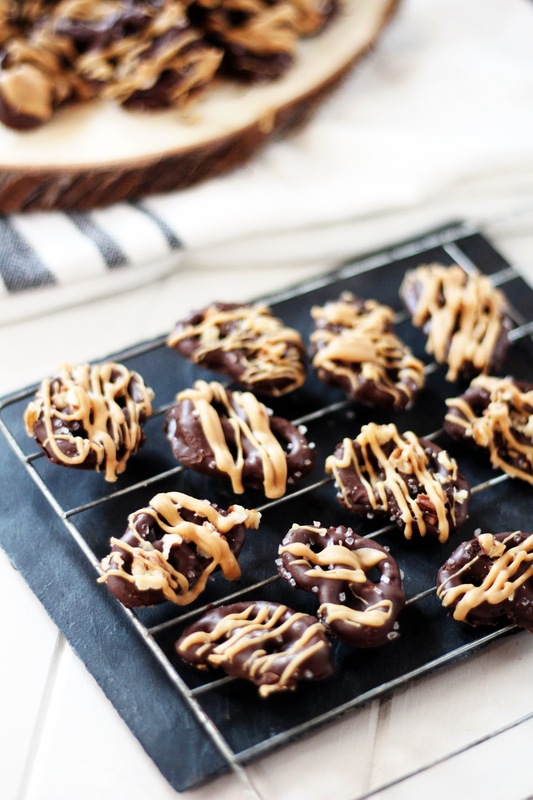 I was hoping for a recipe for my cookie boxes and I scored with these Salted Peanut Butter Pretzels. They are the perfect blend of sweet and salty. Every time I passed by my container I would open the lid and pop one in my mouth. I’ll have to make another batch for the boxes. 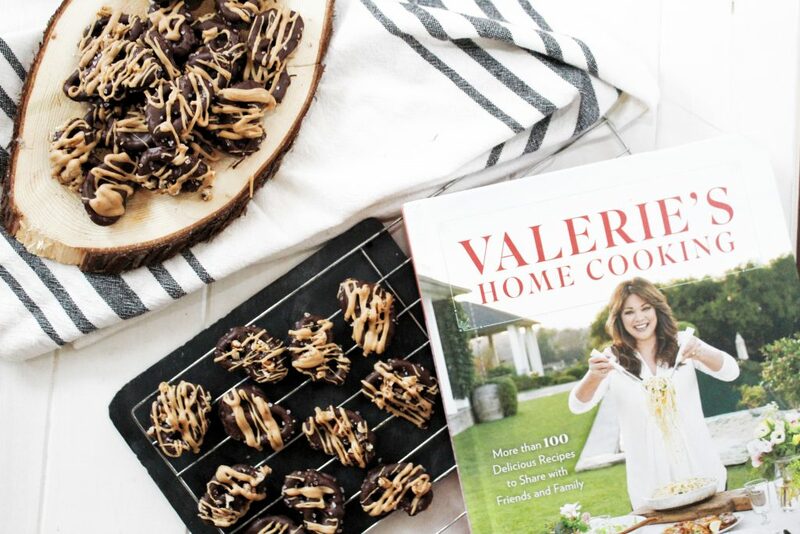 Have you seen Valerie’s cooking show, Valerie’s Home Cooking? She is such a down to earth cooking gal, kind of like me (if I do say so myself). She was also my favorite on One Day at a Time. Her cookbook is amazing and I can’t wait to make so many of the dishes in the book. Below is the super simple recipe for these Salted Peanut Butter Pretzels. I added the salt because I can’t seem to make anything with chocolate and not include the salt. And I’m from Texas so we add pecans to a lot of things. You can leave both off for the original intent but I kind of like them either way. Place chocolate chips and one tablespoon of vegetable shortening in a microwave safe bowl. Heat on high in :30 second increments, stirring after each segment, until melted. Using a fork, dip Pretzels into chocolate and tap on bowl to allow excess chocolate drip off. Sprinkle with salt and pecan bits. Place in the refrigerator for 30 minutes to set. Place peanut butter chips and remaining shortening in a microwave safe bowl. Microwave on high until smooth, in :30 second increments. Place melted peanut butter in a ziploc bag and snip a small piece off one corner or drizzle with a fork. Chill in refrigerator for 15 minutes. Store in airtight container. 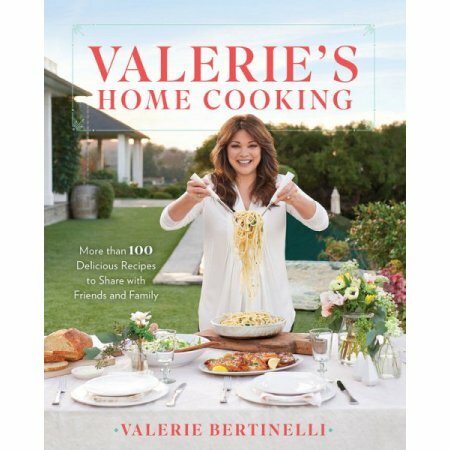 ** I received a copy of Valerie’s Home Cooking to review. All opinions are my own. 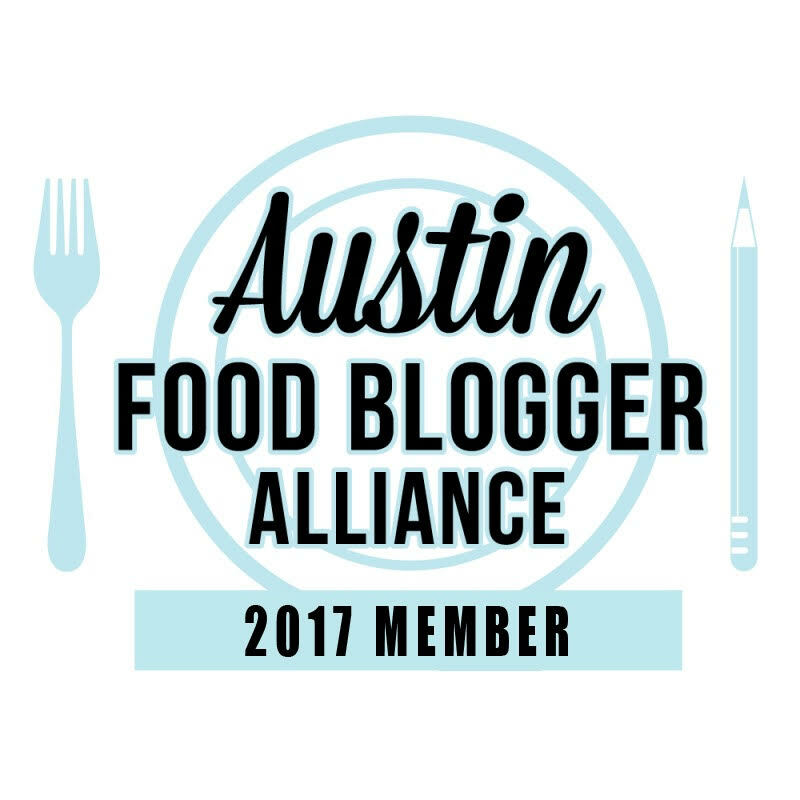 ** Affiliate links are used for the cookbook. If you click and purchase through the link, Amazon will give me a small commission for the sale which helps pay for the hosting for this website so thanks!